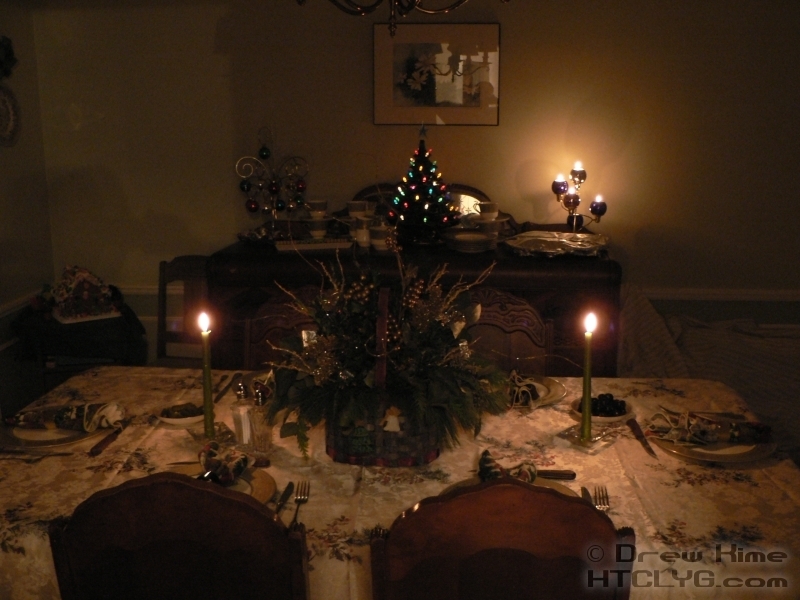 The traditional showpiece of the American holiday meal is either a roast turkey or a giant ham. If you really want to impress someone, go instead for a standing rib roast. The recipe is about as simple as can be and the preparation is even easier. 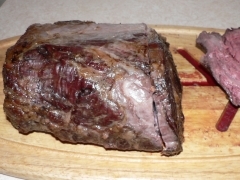 The key is a simple preparation of the best cut of meat you can get. You may look at the length of the directions and wonder how I can say it’s easy. It’s because there aren’t very many steps that each step is so important. And when you’re working with a $60 piece of beef you don’t want to miss something, so I’ve included lots of detail along the way. 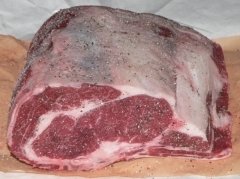 When ordering the rib roast, ask the butcher to leave about a quarter-inch trim of fat over the whole roast. If you aren’t able to place a special request, or if the trim is too close and there are large parts of the meat showing through the fat, you’ll need enough fatback to cover the whole top. 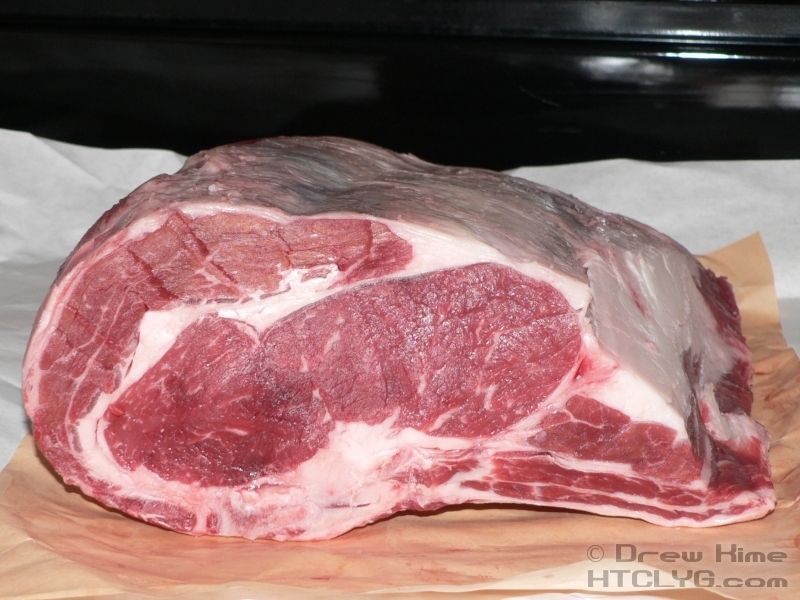 The one I got was in between: enough fat to not need the fatback, but not enough to trim. Here you can see the three bones across the bottom. 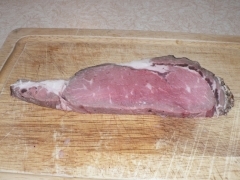 If you get one with a thick layer of fat, trim it in one continuous piece right where it joins the meat. Leave it attached at one end of the bones. It should form a flap that covers the entire roast. 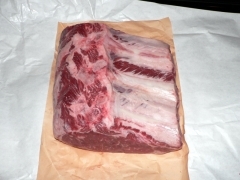 If it had a narrow “low-fat” trim, arrange one or more pieces of fatback so they cover the entire roast, then set the fatback to the side. 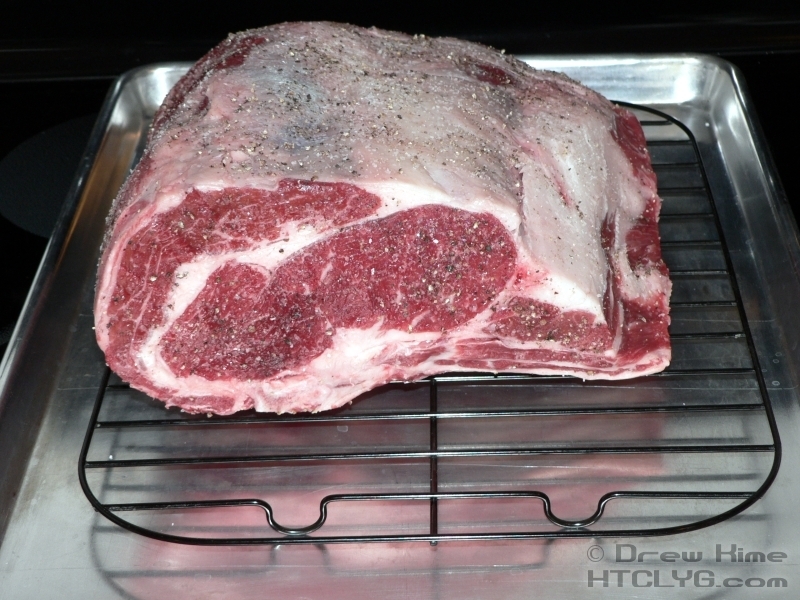 Now that you have the meat exposed, coat it liberally with kosher salt and fresh ground black pepper. Do the bone side, too. 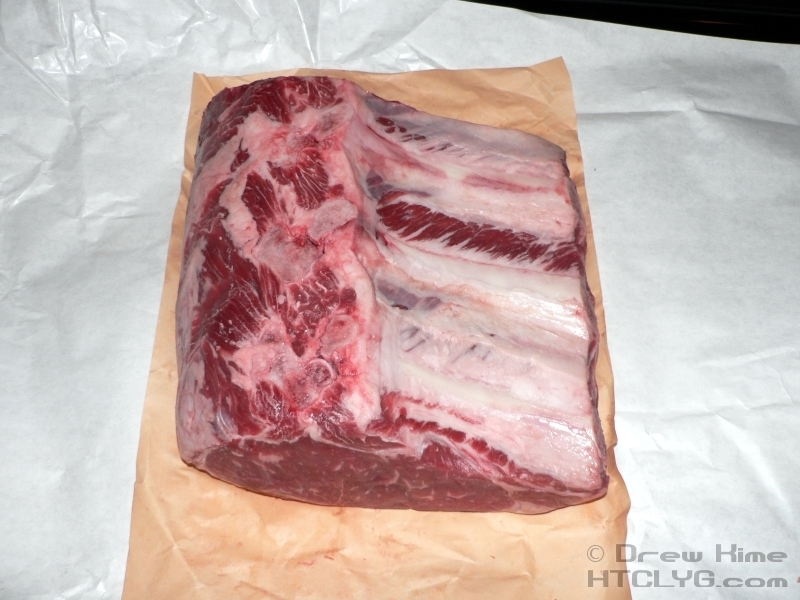 Fold the flap of trimmed fat over the meat, or cover with the fatback. Tie the roast at each bone. 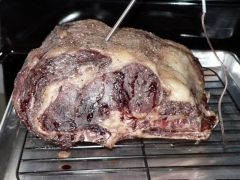 If you’ve never tied a roast, ask your butcher to show you how. If you don’t tie it, the fat will curl back as soon as it starts to cook and the exposed meat can dry out. I wish I could show a picture of this, but like I said mine was trimmed too close. 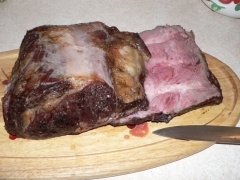 Finally, place the prepared roast, bone side down, on a rack in a shallow, stovetop-safe glass or earthenware casserole dish, or a flat baking sheet. 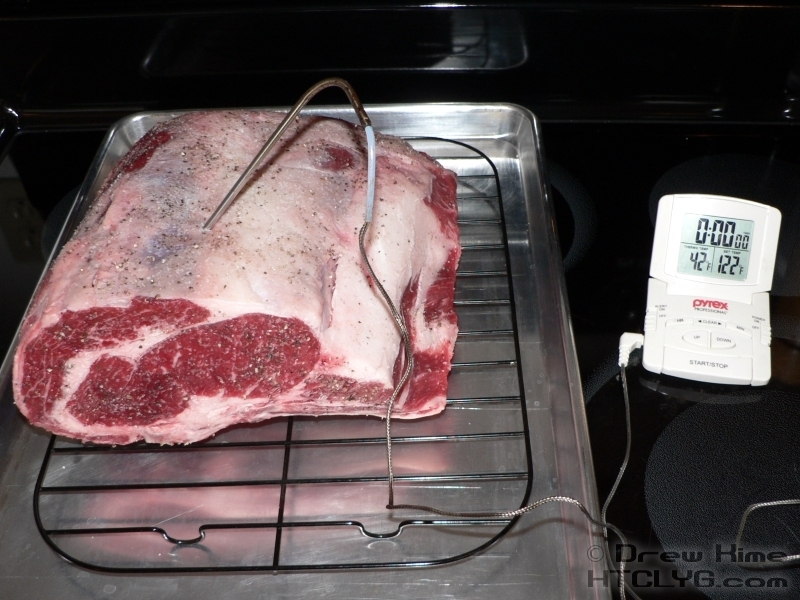 Insert the probe of a digital meat thermometer in the top of the roast, so that the tip is as near the center as you can get. Here I’m measuring to make sure I hit the center. Then I insert the probe and connect it to the thermometer. 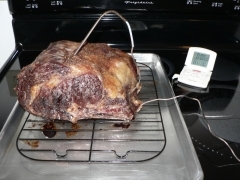 Set the thermometer for 120° — or as close as your thermometer will go, mine doesn’t go below 122° — and place the roast in a 200° oven. The wire on the probe lets you keep an eye on the progress without opening the door. Digital thermometers with remote probes cost less than $20. 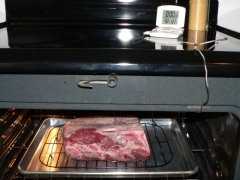 If you’re cooking a $60 piece of meat, don’t guess ”“ buy the thermometer. Now comes the hard part: Leave it alone. Don’t check on it. 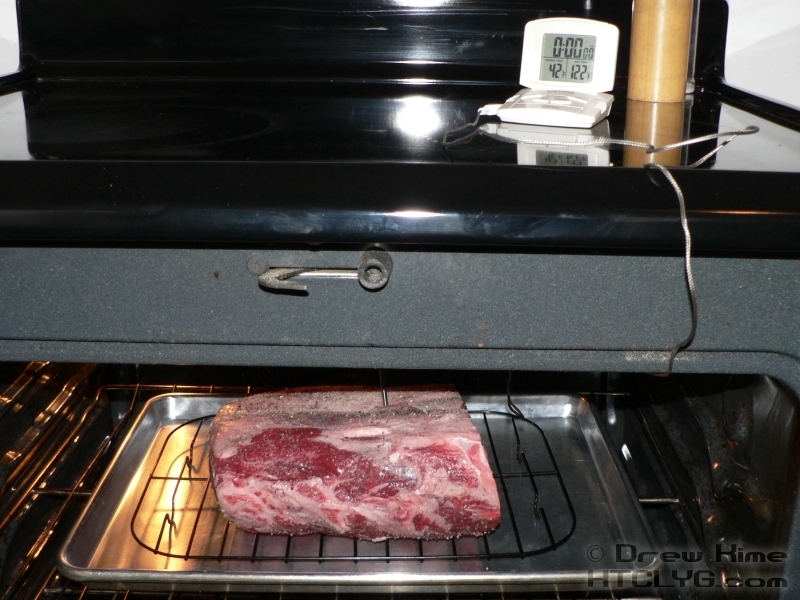 Don’t baste it. Don’t open the door to see how it’s coming. All you need to know is when it hits 122°. 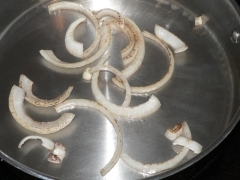 Work on the side dishes. Make the horseradish cream sauce. Entertain your guests. At this low temperature every time you open the door and let the heat out you’ll be adding nearly a half-hour to the overall roasting time. When the thermometer reads 122°, take the roast out and wrap it with heavy aluminum foil. Here is what it looks like now. Note that it has given up almost no juices. And here it is covered. I just ripped the foil to go around the probe. DO NOT remove the probe. You will lose more juice through the hole than you would believe. Turn the oven up to 500°. 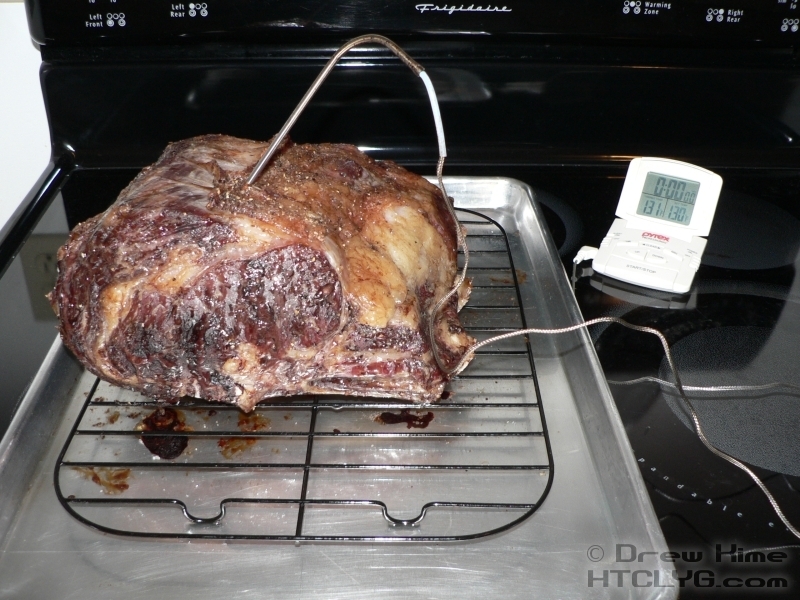 While the oven is warming up, you will see the temperature on the roast continue to rise. When the oven hits 500°, or the roast hits 130°, remove the foil, remove the layer of fat (which I didn’t have) and put the roast back in the oven. Keep an eye on it to see when a nice crust has formed. It should be less than 10 minutes. 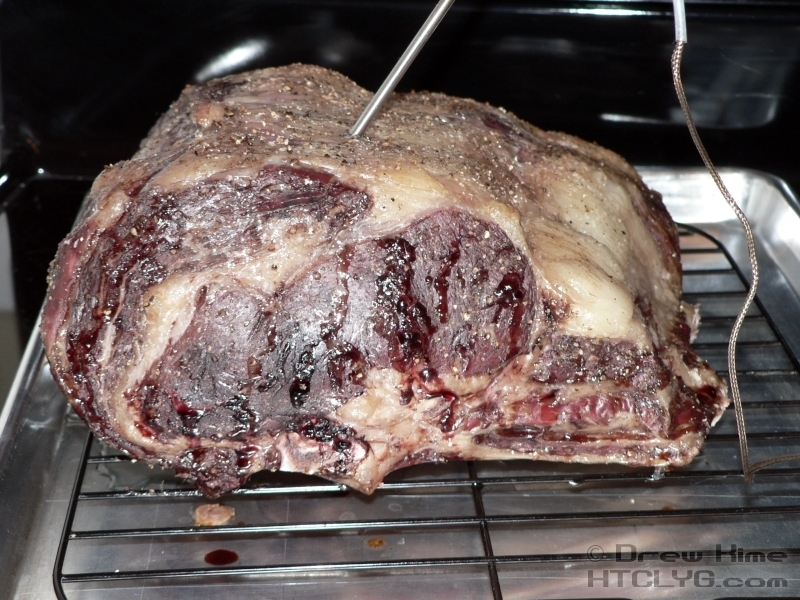 Remove from the oven (you can turn it off now), and transfer the roast to a cutting board. Leave the probe in. Put a serving platter in the oven to warm up. 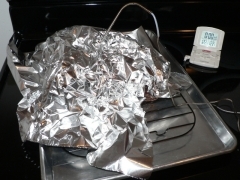 Cover the roast with foil again and let it rest for 20 minutes, or until you see the temperature peak and start heading back down, whichever comes first. 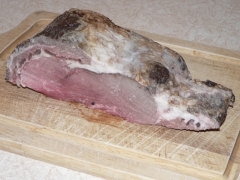 To carve, turn the meat upside-down on the cutting board and cut away all the strings, if you didn’t remove them with the fat before finishing the crust. Using an electric knife or filleting knife cut all the bones away from the meat in one piece. Hide the bones where your mother-in-law won’t find them before you get to them. (Hi, Nancy!) They make an excellent chef’s snack. 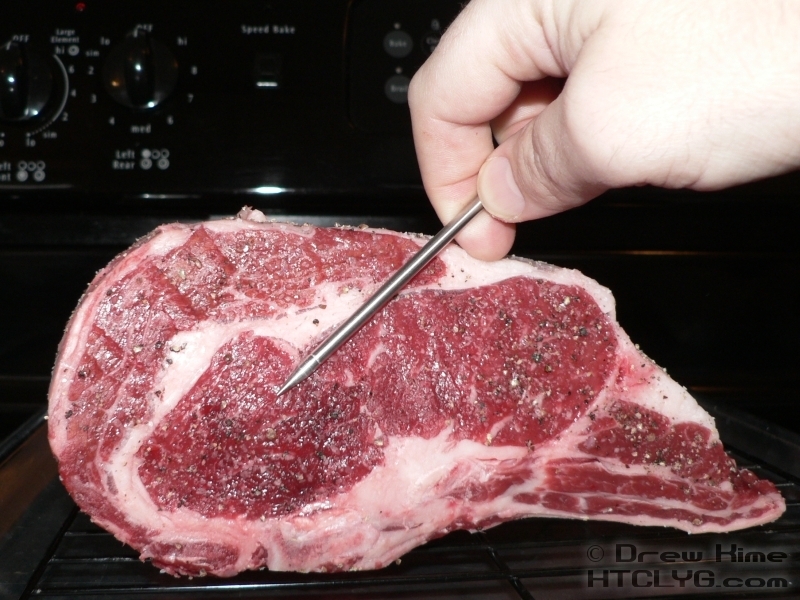 Turn the meat back over onto the cut side where the bones were. 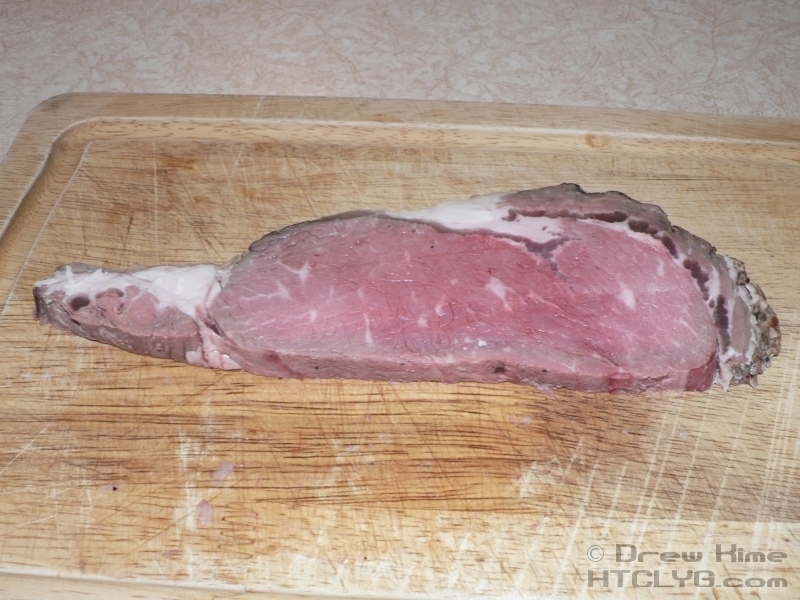 Carve slices up to a half-inch thick. 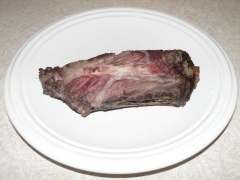 You should typically get about two slices for each bone so use the width of the bones as a guide. Take your warmed serving platter from the oven and reassemble the entire roast onto it. If you got a lot of juices from the carving and your cutting board has a channel for catching the juice (look two pictures back) use this to make an au jus. Divide the au jus and the horseradish cream sauce into individual bowls before bringing them to the table. 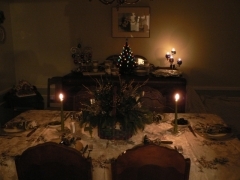 Serve the meat from the platter at the table. The next morning, cut the ribs apart. Place one on some foil in the toaster oven for about five minutes at 400°. Let it cool a bit and gnaw on it like a caveman. If you look at the cutting board you’ll see where I learned you shouldn’t use an electric knife on a wooden surface. Oops. Carve off a piece about a quarter-inch thick. 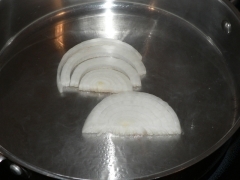 Get some onions going in a very hot pan lubed up with melted bacon fat. Toss them a bit so they get a little brown all around. Add the prime rib and let it cook for about 30 seconds to a minute without touching it. 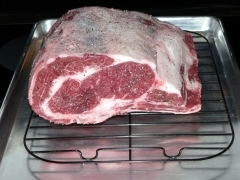 Add a little kosher salt. 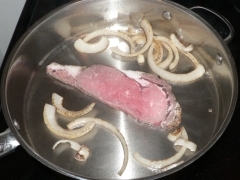 It’s ready to flip when a quick shake of the pan makes it move around. At first it will stick to the pan, but as the surface caramelizes it will break free. Yay for the Maillard reaction. Flip it over and give it another 30 seconds to a minute. Split and lightly butter a French or crusty Italian roll, and throw it in the pan to toast it. 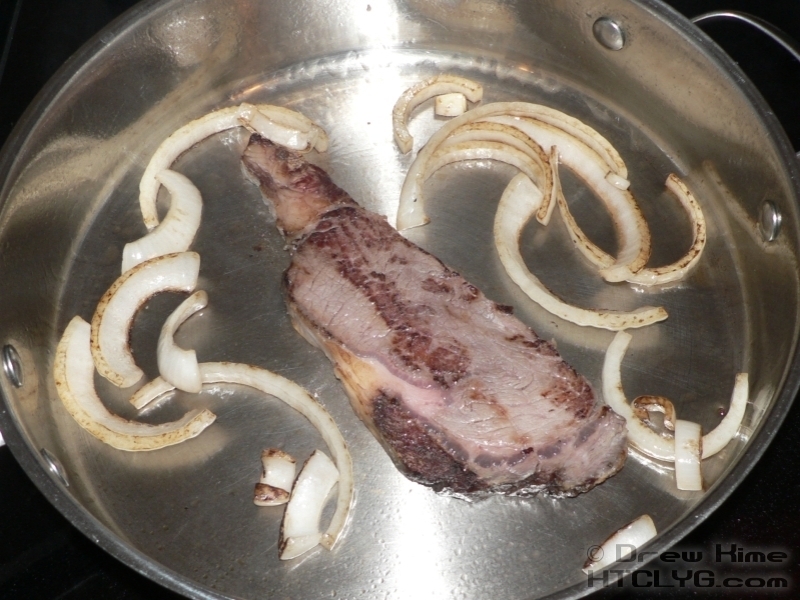 If there’s still a good bit of bacon fat in the pan (like I had) you can skip the butter. 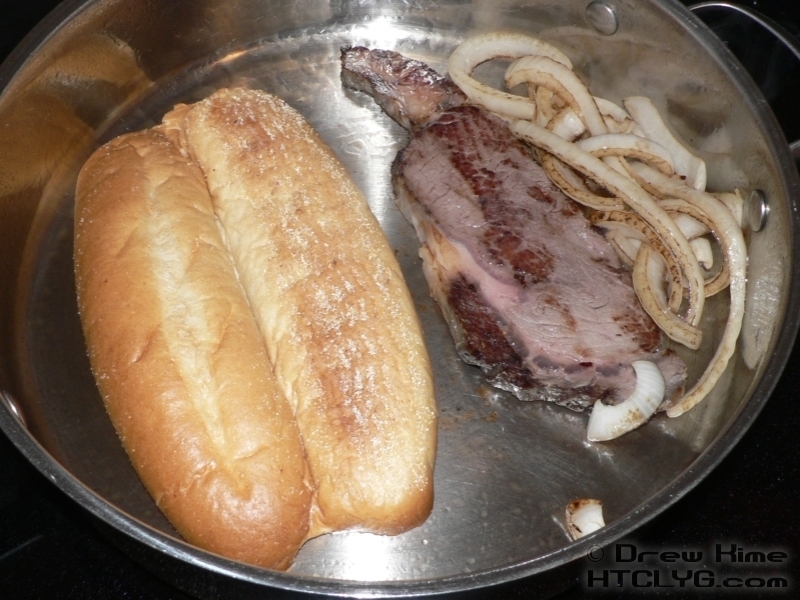 You just need it moist enough that the bread doesn’t stick to the pan. Remove everything from the pan and assemble. You can add cheese, but it really doesn’t need it. 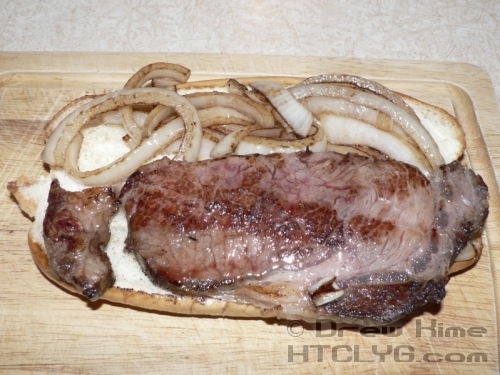 I wouldn’t think this was ruined if you replaced half the onion with an equal amount of mushroom. 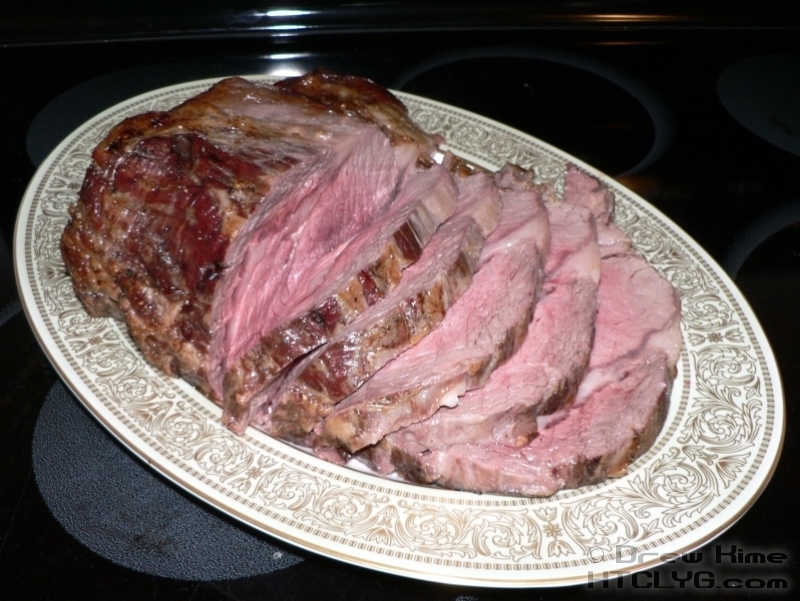 But for goodness sake, don’t bury the prime rib in vegetables. This sandwich is all about the meat. 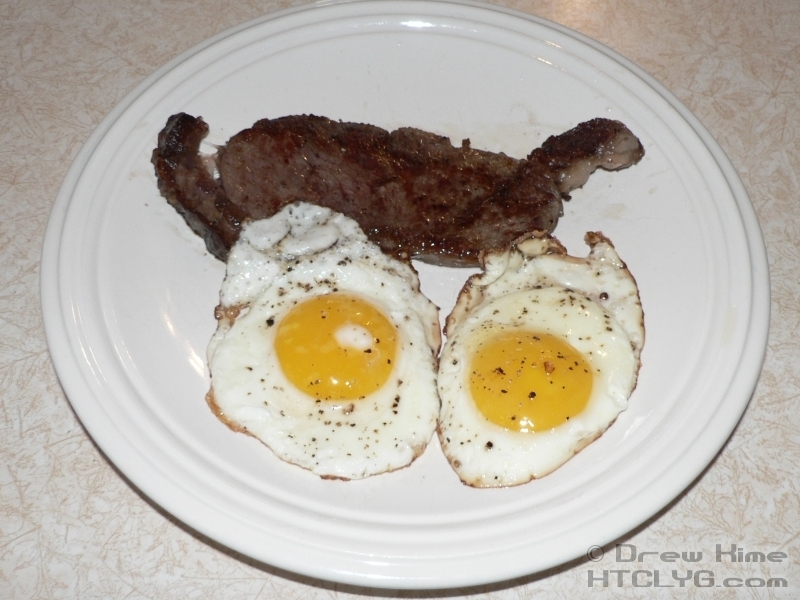 For breakfast the next day, fry it up the same way as the sandwich, but without the onions. Add a couple of eggs, sunny side up with kosher salt and plenty of cracked black pepper. And if this is your third straight day of eating prime rib — it was for me — plan on having a salad for lunch. You’ll need it.